I can honestly say there are a hand full of authors that wins my support one hundred percent. Gary Starta is one of those authors. He has a writing proficiency that is impeccable and never predictable. An author that does his research to ensure a gripping and believable reading experience. 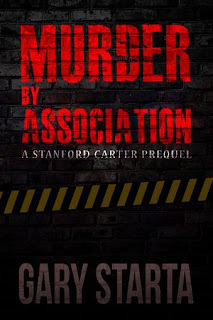 Murder by Association, the thrilling, mind-blowing, blood chilling prequel to Starta's BLOOD WEB. The protagonist Caitlin Diggs teams up with Detective Stanford Carter, and McAllister in the pursuit of an unhinged killer known as “The Plunger”. As they uncover the enigmatic and horrific clues they find themselves wondering if the evidence will lead them to the killer(s) or reveal additional questions that could possibly alter their lives forever. Gary Starta has done it again. You’ll love the explosion of excitement in this thriller that will keep your brain in over-drive as you try putting the pieces together and cheer the main characters to solve the serial killings.